Eat it when it is cold from the fridge. It’s so refreshing. 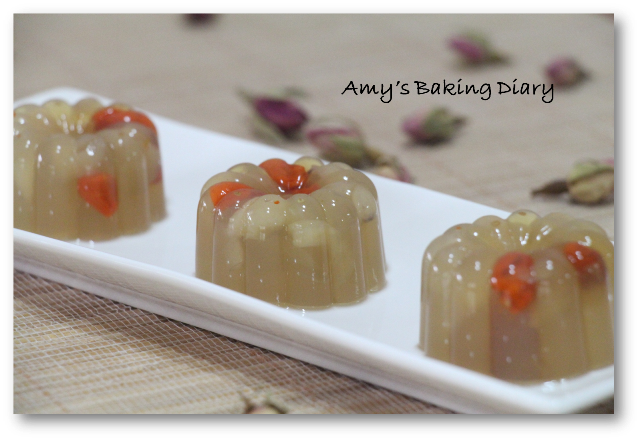 If you would like to, you may add Osmanthus (桂花) to it. 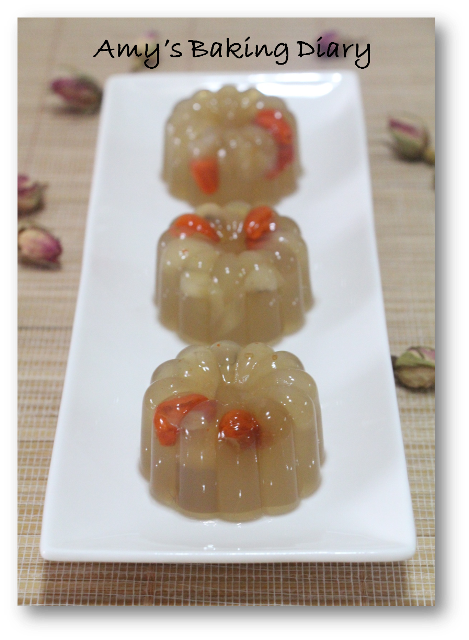 Osmanthus will add fragrant to the agar agar. 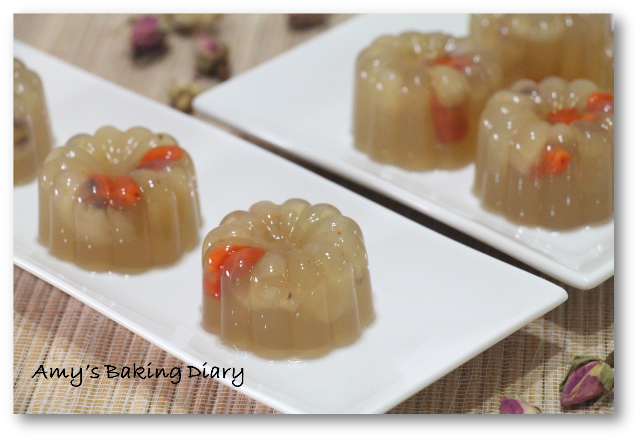 This is an easy and well loved desserts treat especially for hot weather like Singapore. (1)Cut agar agar into short lengths and soak them in the water for awhile. Chop dried longan. Rinse and soak Qi Zi (wolfberries) thoroughly. (2)Bring 2 cups of water to the boil. 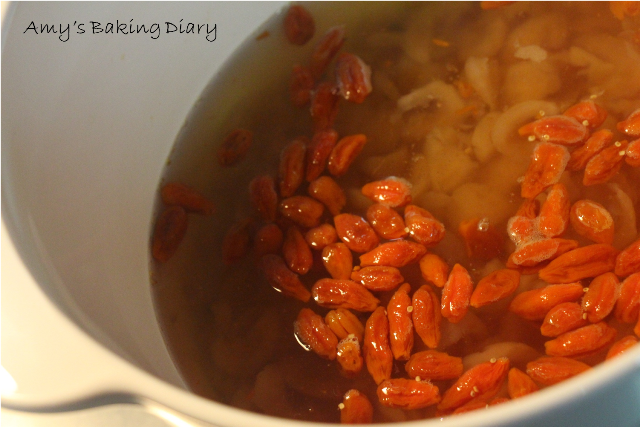 Add dried longan and cook for 15 minutes. Add Qi Zi and cook for awhile. Put in rock sugar and cook until it dissolves. (3)Bring the remaining 2 cups of water to boil. Add agar agar and cook over low heat until it dissolves. Pour in the syrup from step (2). (4)Pour the mixture into moulds. Set aside to let it cool and refrigerate until it is set. Un-mould and serve in cool. 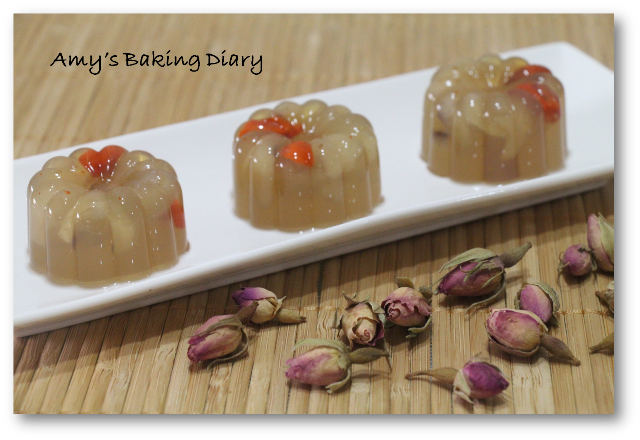 This recipe is adapted from 美食厨典第五版 – 100 中试甜品, which I bought it from Page One bookshop in Hong Kong. I’m also submitting this for Cook-Your-Books #15. Ooh....looks so cooling and refreshing! Would definitely love to have some right now! hi amy, the title of the book sounds familiar, i may hv the same book too..:) yeah, just saw your comment back on my blog. Hopefully one day we can meet each other too! oh and btw, i have the impression that you are a very young cheerful lady and when you mentioned that your children are big, i was like ' wow' ! Looks refreshing and so pretty! A very cooling dessert indeed!